A petition inspired by UTLA social justice activist Jose Lara is calling for the immediate removal of the name D.W. Griffith from an East Los Angeles middle school because his 1915 film, “The Birth of a Nation,” celebrated the Ku Klux Klan. The demand follows nationwide calls for the removal of Confederate flags from public spaces in the aftermath of the June 17 shootings of nine people in a Charleston, S.C. church by a suspect who said he was motivated by racism. David Wark Griffith Middle School, at 4765 E. 4th St., has 1,400 students 6th through 8th grade. One percent of the students are white, one percent are black, and 98 percent are Hispanic. It is in Mónica García‘s District 2. The school opened in 1939. Lara was recently named the 2015 Social Justice Activist of the Year by the National Education Association (NEA). He said the idea for a petition came after he read an NPR story about Griffith’s film, which made Klansmen look like heroes. 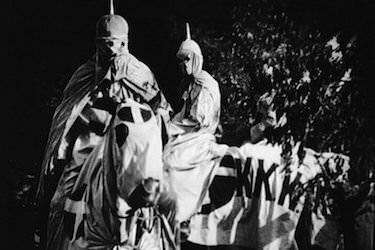 The three-hour film starts with the scroll: “This is an historical presentation of the Civil War and Reconstruction Period, and is not meant to reflect on any race or people of today.” The film was originally called “The Clansman” and is based on a book that glorified the KKK. Some of the black characters were played by white men in black face, and the film ends with Klansmen riding in to save the South from black rule during Reconstruction. “Our kids should not go attend a school named after someone who glorified the KKK,” wrote Leopoldo Urias who signed the petition. Lara said he planned to present the petition to the school board after he collected more than 200 signatures. He almost reached that goal in less than 24 hours.